Sunday, 15 May 2011, Day 173/365. 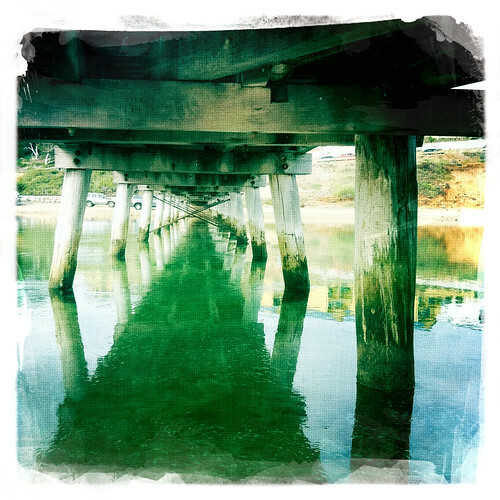 I often walk on this jetty but rarely look underneath it. This time it was different. It’s easy to become stuck in your daily habits of doing the same thing and looking at things the same way. I’m finding that with my Project 365 that I look at things differently because it’s what you do when you need to take a photo every day for a self-imposed challenge. I’m also trying, when I wake up in the mornings, to think positively about the day ahead instead of negative thoughts about not having enough work. It’s not easy to change habits but I’m trying. Oh, and PS, I’ve started a new website. It’s early early days yet, but go check it out. Hi Jen, I just checked out your new page. It looks great. A great testament to your prowess online:). I’ll definately be subscribing.